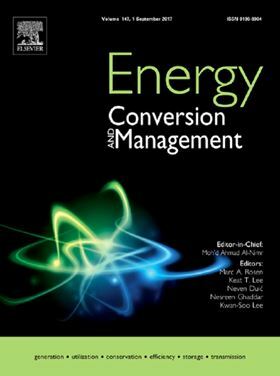 The research article 'Potential of a thermofluidic feed pump on performance improvement of the dual-loop Rankine cycle using for engine waste heat recovery' has been published in Elsevier journal Energy Conversion and Management. The dual-loop Rankine cycle system is considered as the most effective way to recover the multi-grades waste heat of engine. However, the power consumption of mechanical pump is relative high, especially for that in the low-temperature loop of dual-loop Rankine cycle, which will influence the system efficiency and power output. Therefore, a thermofluidic pump driven by the engine coolant heat instead of electric energy is used to replace the mechanical pump of low-temperature loop in this paper. The effect of the design parameters on the performance of thermofluidic pump are analyzed firstly. There is always a reasonable height distribution among the components that makes the mass flow rate of thermofluidic pump achieve to maximum, which contributes to a smaller volume and less pressure fluctuation of pump. Then several working fluids are selected as the candidates for systems with thermofluidic pump and mechanical pump. Based on the comprehensive analysis (utilization rate of engine coolant, the energy and exergy efficiency, and output power), the R1234ze is regarded as the most suitable working fluid for both system with thermofluidic pump and system with mechanical pump. Afterwards, a comparison analysis between systems with thermofluidic pump and mechanical pump is implemented in the low-temperature loop. Results indicate that R1234ze based low-temperature loop with the thermofluidic pump has improvement of 7.6%, 9.1% and 7.7% on net power, thermal efficiency and exergy efficiency respectively compared with that of low-temperature loop with the mechanical pump. In addition, the mass flow rate will decrease by 8.6% in low-temperature loop, which conduces to reduce the size of component of cycle. All the results indicate that thermofluidic feed pump is an effective way to improve the performance of dual-loop system.